A New York Public Library Book for the Teen Age. The story of a boy's search for order and belonging in a world where the rules keep changing. Harlan Hawkins is a kid with a passion for baseball. He plays first base on his summer league team, obsessively collects baseball cards, and avidly follows the fortunes of his beloved hometown Minnesota Twins. And then his world is suddenly, inexplicably shaken when his mother is diagnosed with multiple sclerosis, and his hard-drinking, explosive father abandons them. The family quickly descends into awkward suburban poverty. Sport charts the boy’s struggle for survival, for love and safety, for belonging and self-knowledge, through a series of adventures that are sometimes funny, sometimes terrifying, often both. Sport is about the world as we wish it to be—and the world as it is: frail and broken, dangerous and doomed, terrible and beautiful. Sport is about learning to love the broken world. "Some people should never get married, and when they do, it generally makes for a good story. Mick Cochrane knows this, bless him, and the broken family he gives us in Sport, yields both familiar and fresh heartbreak in generous portions. It's also a very funny book." 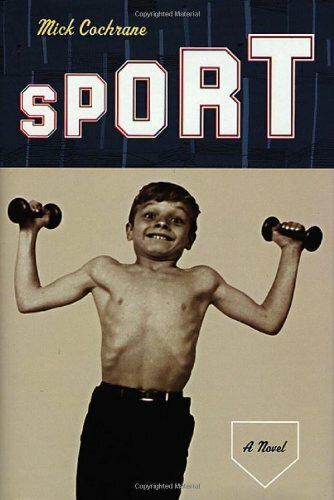 "Harlan 'Sport' Hawkins is a boy whose love for baseball and innate sense of goodness fuel an American Dream while he lives in a household that is anything but. A modern-day Huck Finn-- honest, faithful, and wise beyond his years-- Sport will steal your heart only to break and reassemble it in a way you'll never forget. Mick Cochrane is a writer of immense talent and Sport is a grand slam." "What I can tell you about Sport is that it is damn wonderful. There isn't a line in it that doesn't shimmer with truth. Sport teaches us, broadens us, pushes our horizons back and allows us to take in what our hearts already know but won't often admit-- that there is human misery behind every door, all of it unique, all of it deserving of our care and compassion and understanding. Cochrane writes with a sympathetic but unsparing eye and in a style that is economical, energetic, and brilliantly luminous. The characters jump off the page, fully realized and unforgettable. What the hell more can a reader ask of a book." "In this wise, witty story set in West St. Paul in the '60s, a kid named Harlan navigates life by focusing on the Twins baseball team, a comic metaphor for hope. Sport is fat with small pleasures. It is a homer and a gift to all of us grownup knothole-game kids. There's a lot to love in this quiet little book, most of all its subtle wisdom about establishing individuality and finding joy amid chaos-in short, about growing up." "Short and sweet, though not too sweet, and blessedly free of sentimentality. Mick Cochrane's intuitive, easygoing style finds a perfect balance mediating between the child and adult points of view." "With beautifully clean prose, Mick Cochrane has given us a novel evocative of everything from Emerson to Kerouac-nothing could be more American."